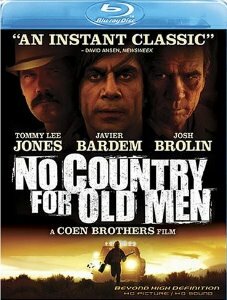 Another twisting, twisted film from the relentlessly creative Joel & Ethan Coen! 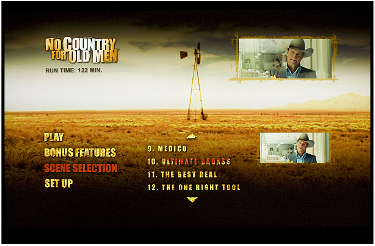 In one of the extra features, members of the cast suggest various genres that No Country for Old Men might fit. 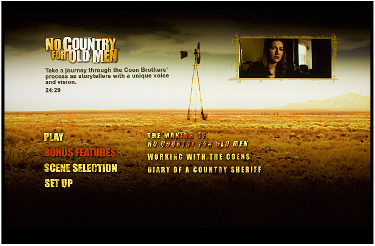 One offers, "a road movie"; another, "a chase movie," still others suggest: "horror, western, crime story, noir and comedy" until Kelly Macdonald settles for "It's a Coen Brothers film. They're their own genre." NOTE: It ended up winning Oscars for - Best Picture, Best Director, Best Adapted Screenplay and Best Supporting Actor! (Spoiler ahead in this paragraph) Perhaps the most peculiar thing about this film is how it plays with our expectations about character, plot and time. The first two are dealt with in a way that can be very off-putting since the three main protagonists do not actually cross paths, though they chase each another from one end of the film to the other. As if that weren't enough, this fact is intimately, though obliquely, connected to the Coen's treatment of time. It's not like the story isn't linear. It is – more or less. It's that there is an important layer, seen from the perspective a single character, which is itself a meditation about time and how we see ourselves passing through it. One way to think of this is that our sense of time can be understood in terms of morality (thus, the Bible.) We human, especially Westerners, like to think that we are on a course guided by the Heavens and that our journey has a special relation to time that doesn't apply to the rest of God's creations. When we come up against events that antagonize our sense of what is supposed to be, they disturb our sense of time as well. Those Zen folks may have something there when they contend that unhappiness is derived from expectation. I shall say no more. Sheriff Ed Tom Bell (Tommy Lee Jones) reflects on a case that continues to baffle him. 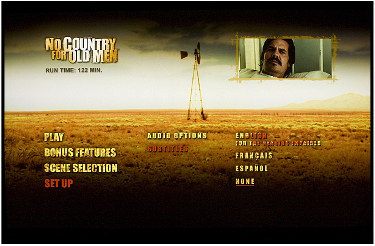 Llewelyn Moss (Josh Brolin) is a tough, self-assured West Texan who comes across a drug deal gone bad with bodies scattered all to hell, a truckload of dope and a satchel with a couple million in cash. Moss is not a stupid man, but neither is he willing to let ill enough alone, and so he makes off with the money. He tells his wife (Kelly Macdonald) to make haste to her mother's while he tries to put the inevitable demons off his scent. The problem is that there are so many of them, each with their own agenda, often at cross-purposes. 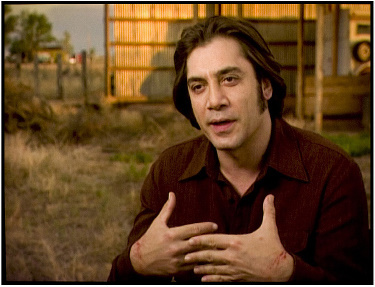 Most dedicated is Anton Chigurh (Javier Bardem) – more devil than man – who faces his victims with a pneumatic gun and a coin toss. Sheriff Bell chases down leads as matters spin out of control and bodies pile up left and right. The score of 9 indicates a relative level of excellence compared to other Blu-ray DVDs. The score in parentheses represents: first, a value for the image in absolute terms; and, second, how that image compares to what I believe is the current best we can expect in the theatre. 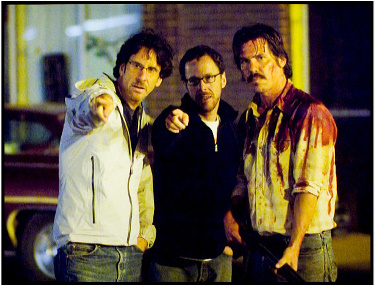 The Coen's on-location photography takes better than average care with sharpness and deep focus. 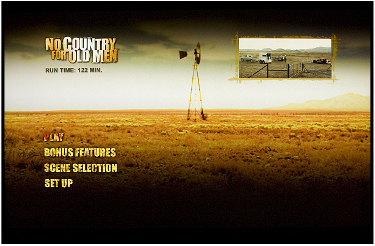 Except for some of the opening long shots of the West Texas desert that are less than razor sharp, the transfer suggests a theatrical experience with no artifacts I care to complain of. The picture is somewhat desaturated, higher than average contrast, and often just a little overexposed, suggestive of the desert – about as I would have expected in the theatre. Carter Burwell's evocative original score and the 5.1 uncompressed audio mix both get high marks for clarity and dynamic presentation. From whispered dialogue to the unnerving power of a nail gun, from the stillness of a desert night to a chase by jeep and dog, from the sound of weapons close by to shots heard around the corner, the effects possess that Coen realistic touch that makes the fiction of cinema a little hard to keep in perspective. This is a scary movie. Miramax Blu-ray DVDs are distributed by Buena Vista, whose hand can be seen in their usual endless promos and previews that, mercifully, can be chapter-skipped before the endless loading of the feature film begins. I have a particular dislike for the long void between the two loading periods in advance of the main menu during which we are easily misled to hit the panic button. On the other hand, menu operations are painless and informative even to the point of including times for each of the extra features – a nice touch since there are no chapter stops for them. On still another hand, we have yellow subtitles, all the stranger considering a color scheme that tends toward warm. There are three Bonus Features of about 24, 8 and 7 minutes, respectively. 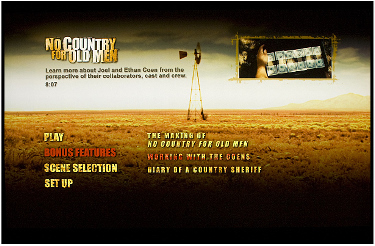 The Making of No Country for Old Men looks at the process of translating the book into a Coen Brothers movie, including comments from cast and crew about casting, locations and art direction. Working with the Coens is essential viewing for those of us who have wondered about how a movie can have two directors. Tommy Lee Jones reflects on his character in Diary of a Country Sheriff. 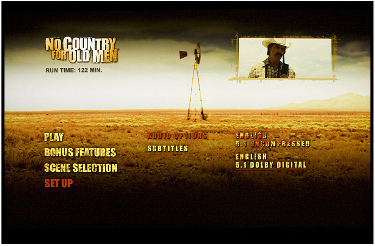 The specification on the back of the case indicates that the Bonus Features are presented in "480i High Definition." This turns out to be optimistic at best. I leave it to you to decide the intention of the designation. The Extras are all pretty good 4:3 SD, except for fragments of the feature inserted in 480i letterboxed mode. Despite the informative content, I feel this presentation is unacceptable, given the Blu-ray format. Perhaps the result of a rush to get the DVD on the street. Another sly, off-beat thriller from the Coens in terrific image and sound. Only the med-fi Extra Features preclude a Highest Recommendation. But I would urge picking up anyhow, unless you're gambling on a future double dip.